More Harm Than Good? 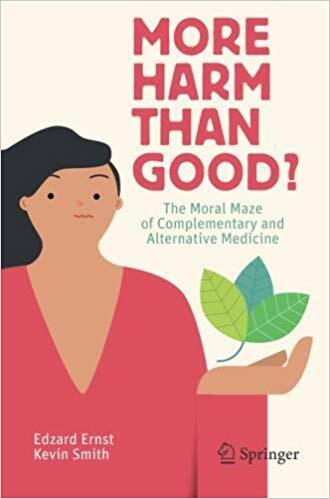 The Moral Maze of Complementary and Alternative Medicine. By Edzard Ernst and Kevin Smith. New York: Springer Publishing, 2018. ISBN 978-3-319-69940-0. 223 pp. Softcover, $22.99. “These basic ethical requirements are frequently neglected, ignored or willfully violated in CAM,” the authors say. They address these precepts one by one in great detail, showing how CAM fails to measure up. They support their argument with plentiful examples from the clinical practice of CAM practitioners. The book begins with a primer on medical ethics. They discuss the frameworks of nonconsequentialism and consequentialism and show how the framework of principlism attempts to factor in both of those approaches, resulting in four core principles: respect for autonomy, nonmaleficence, beneficence, and justice. There is an excellent chapter on research fundamentals (what good research should look like). It covers pitfalls in research, p-values, placebo controls, double blinding, systematic analyses, prior probability, and other crucial topics. The following chapter covers the problems with much of CAM research, focusing on these issues: insufficient numbers of participants, lack of a control group, inappropriate control group, control group present but otherwise flawed, use of surrogate endpoints, misuse of statistics, “too good to be true” results, and fraudulent research. The authors provide numerous examples of each and speculate about possible reasons for poor research design (perhaps the CAM researchers realize that a properly controlled study would show that their treatment doesn’t work). Any study with the design “A + B versus B” will guarantee a positive result, even if A is ineffective. Doing such studies is not only useless but unethical, because it fails to answer a meaningful question and wastes resources. They explain why anecdotal evidence is woefully inadequate: “Indeed, findings that accrue from this approach are liable to grossly misinform clinical practice; in this way, anecdotal evidence can often be worse than no evidence at all.” Much of CAM research is no better than an assemblage of anecdotal cases. They argue that certain unavoidable features of CAM education render it an almost intrinsically invalid enterprise. It often resembles a religious cult, and it expropriates and corrupts core concepts from mainstream medicine. Students who enroll are not provided with accurate and sufficient information and can’t really give informed consent for their education. Chiropractic schools that teach “subluxation” have to teach a corrupted version of evidence-based medicine, because there is no evidence that subluxation is a valid concept, and there is evidence that chiropractic manipulations can lead to serious injury. Naturopaths, chiropractors, and homeopaths are poorly educated about vaccination; this has an impact on public health. Informed consent requires the patient to understand the indication for the treatment, the nature of the procedure, the potential benefits and risks, and other treatment options. Genuine informed consent is unattainable for most CAM modalities. CAM practitioners may peddle untruths for reasons ranging from honest error to deliberate fraud; the consequences to the patient are the same. Falsehoods are always ethically unacceptable. Who should act to fulfill the duty of preventing falsehood-related harm? Individuals, agencies, and the government all share that responsibility. They will state that there is evidence to the contrary. They will suggest that the existing evidence has been misquoted. They will say that medical research is generally so flawed that it cannot be trusted. They will claim that scientific evidence is overruled by centuries of experience. They will reverse the burden of proof. They will say that a new scientific paradigm is required to explain how CAM works. They will claim that scientific evidence and reasoning are not applicable in CAM. They will point out how safe or inexpensive CAM is compared to conventional medicine. They will suggest that the critic is paid by big pharma to defame CAM. They will launch personal attacks on their critics. To nip this in the bud, the authors have provided rebuttals to each of these arguments. And then they address the argument that even if CAM is only placebo, its use is justifiable. Ernst and Smith make a strong case that CAM is unethical and that it does more harm than good. Ethicists should be convinced. CAM practitioners and patients will not be, because their belief systems preclude an unbiased, rational scientific assessment. They will object as Ernst and Smith have predicted, but their objections have already been handily refuted. This book is well organized and well thought out. It was written to inform, not to entertain. It is not an easy or “fun” read, but it’s an important one.